Search engine Google has made headlines with its plans for a self-driving car and Apple—maker of iPhones and iPads—is reportedly planning to develop an electric car. Alibaba and SAIC Motor announced they were jointly setting up a 1.0 billion yuan ($162 million) fund to develop an "Internet car", the auto maker said in a statement on its official microblog. The project will "lead China's Internet car development", it said, but gave no details about the planned vehicle. Alibaba said the future car would use technology—such as cloud computing and big data—to help provide a better driving experience. The connected vehicle will include services such as e-commerce, digital entertainment, maps and communications, it said. Analysts believe technology companies are unlikely to launch mass production of cars, rather seeking to shake up the traditional auto industry and establish partnerships with manufacturers, helping to promote their own business lines. Alibaba's partner for the project, state-owned SAIC Motor, already has joint ventures with General Motors (GM) of the United States and Germany's Volkswagen. SAIC and GM also have a company which provides telematics—wireless information—services for vehicles manufactured and sold in China, including mobile apps and navigation help. 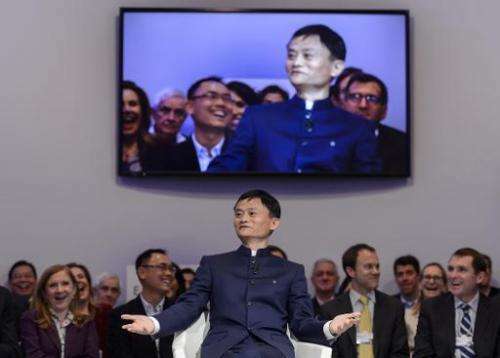 Alibaba, founded by entrepreneur Jack Ma in 1999, is China's biggest e-commerce company, estimated to hold more than 90 percent of the country's market for consumer-to-consumer transactions. Last month, Alibaba tested its first drone delivery service, echoing US online retailer Amazon, by whisking ginger tea to customers over three days in three Chinese cities.